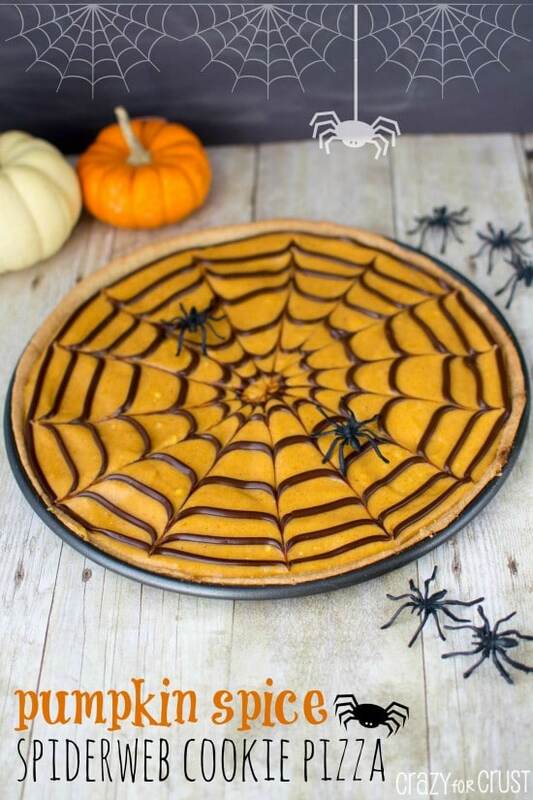 Can you believe it’s been over a week since I shared a pumpkin recipe? I know, I was kind of shocked too. But, to be honest…this isn’t a pumpkin recipe per se. It’s a pumpkin spice recipe – which is almost just as good (or better!) in my book. 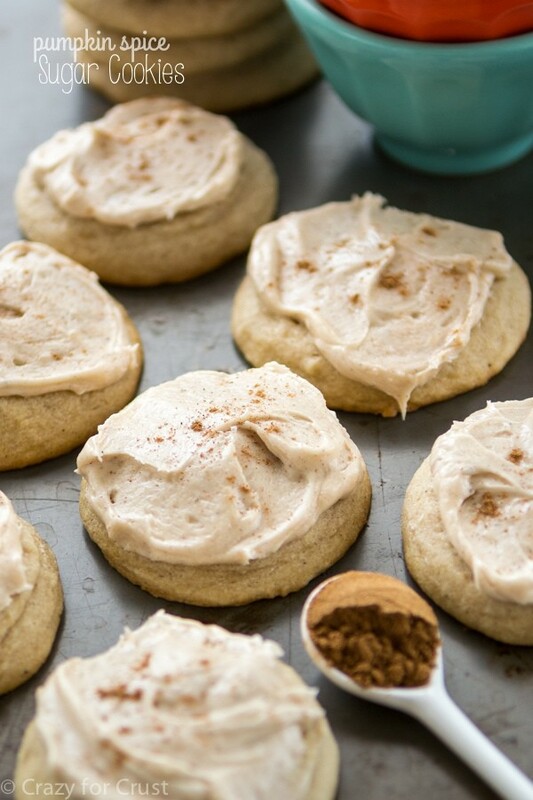 Pumpkin Spice Sugar Cookies – your new favorite cookie! I started posting pumpkin recipes back in August, about 6 weeks ago. Since then approximately 1 billion pumpkin recipes have been shared by bloggers all over the internet. That’s an estimation on the 1 billion. I may be off a few hundred thousand, but I think that number is close. I mean, scroll through Pinterest. Is there anything NOT pumpkin on there? So, I hate to burst your bubble and all but this recipe isn’t reallllly pumpkin. It’s pumpkin spice. Which, IMO, is better than pumpkin right now. Because these cookies? Oh my gosh. They are TO DIE FOR. I literally ate 5 without thinking about it. And then I had to give away a bunch and throw some away (!!!) to get rid of them. These cookies are “cover with coffee grounds in trash” cookies. Some of you get that reference. You know – when you cover food with coffee grounds so you don’t go back digging in the trash for them. Yeah. I’m a classy gal, I’ll tell you that much! Pumpkin cookies are really good. I love adding pumpkin to recipes in the fall, but if you’ve ever baked with pumpkin you know it’s super finicky. It changes the texture and flavor of anything you substitute it in. Unlike applesauce it’s not sweetened or spiced, so you have to add just the right amount of sugar and spices to make the recipe perfect. What I’m trying to say is I love pumpkin cookies, but I haven’t perfected my favorite recipe yet. In the meantime I wanted to share some fall-ish cookies with you so I filled them with pumpkin spices instead. And that? Was a #win idea. Pumpkin Pie Spice is another one of those enigmas to me. You can buy it in the jar or you can make it yourself using different fall spices. But every recipe I’ve found for pumpkin pie spice is different. Cinnamon and nutmeg are always there. But some have allspice, some have cloves and some have ginger. Some have a combination or none of the above. It’s confusing. And expensive. I was going to buy all the components to make my own spice and each bottle was $6. Pumpkin Pie Spice was $6. So I bought the pie spice instead of spending and extra $27. 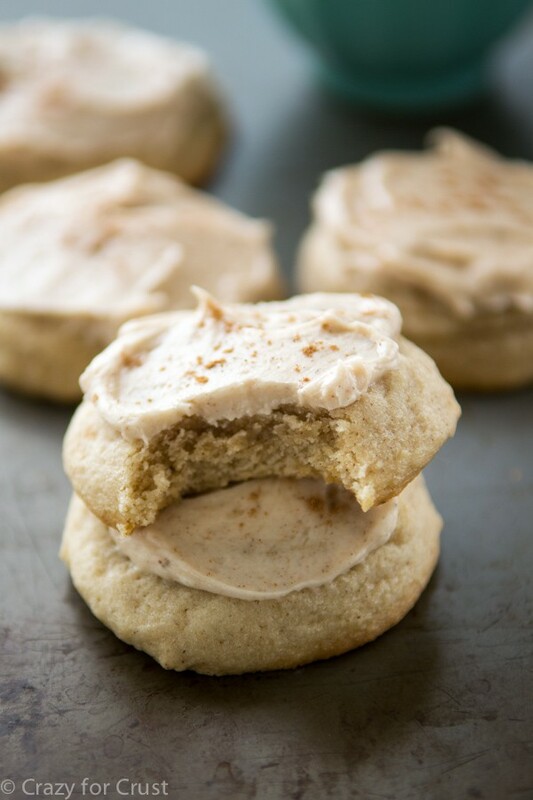 These cookies are my perfect sugar cookie recipe filled with pumpkin pie spice. I slightly underbaked them this time and oh my holy gosh. It’s like fall exploded when you take a bite. 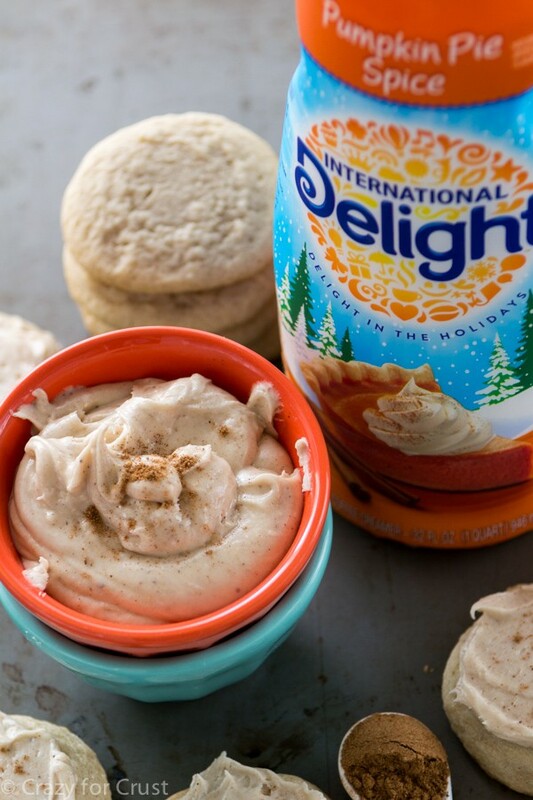 International Delight Pumpkin Pie Spice Coffee Creamer! It’s baaaaaaack. How many of you stockpile this stuff for the off season? It’s good through February. That means I can have pumpkin pie spiced coffee until Valentine’s Day! All of the holiday flavors are out right now and I cannot get enough. SUGAR COOKIE COFFEE CREAMER. I die. Anyway, I added a healthy dose of the pumpkin pie spice coffee creamer to the frosting in place of the milk I usually add. This added another layer of pumpkin spice flavor to the cookies. I swear, these cookies are fall on a plate. Eating them made me want a pumpkin spice latte by a fire, rain, and soup for dinner. Too bad it was still 90° when I made them. A girl can dream, right? Check out all of International Delights flavors on their Facebook page and see their favorite recipes on Pinterest! 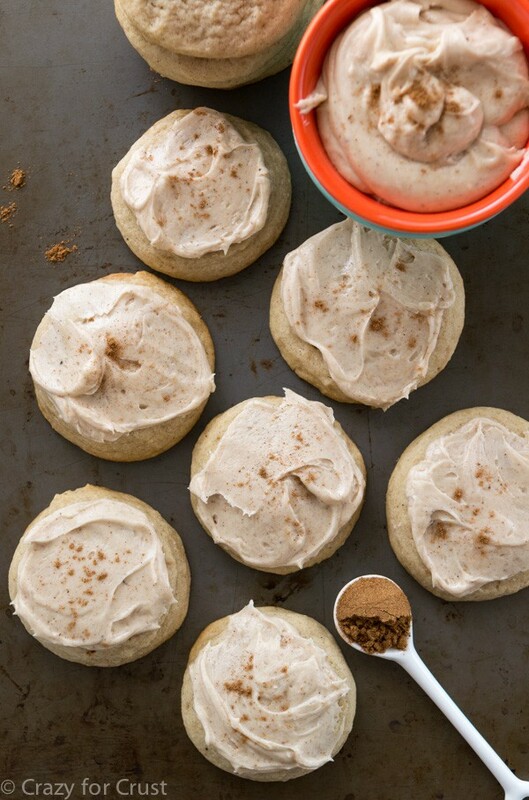 These pumpkin spice sugar cookies are filled with pumpkin pie spice. The frosting is filled with spices and pumpkin spice coffee creamer. Combined, there is fall in every bite! Cream butter and sugar in the bowl of a stand mixer fitted with the paddle attachment. Beat in egg and extract. Mix in pumpkin pie spice, baking soda, cream of tartar, and salt. Slowly mix in flour. Bake for 9-10 minutes. Take them out just as you notice the bottoms start to turn golden (or right before). They’ll finish cooking as they cool. If they get too golden on the bottom before you remove them, they won’t be as pillowy and soft! Cool 5 minutes before removing from cookie sheets. Place on a wire rack to cool completely before frosting. Make the frosting: Beat butter until creamy with a hand or a stand mixer. Mix in salt. Slowly add in powdered sugar until mixture is crumbly. (It will be very crumbly if using a hand mixer, more smooth if using a stand mixer.) Add vanilla and 1 tablespoon creamer. Mix until the frosting comes together and becomes smooth, adding additional tablespoons of creamer as needed for consistency. Frost. Store at room temperature loosely covered. Frosting will semi-dry and cookies are stackable but some frosting may transfer. I’m so drooling right now! I bet these are amazing. I love the texture of them, I want one! haha. Happy Wednesday! 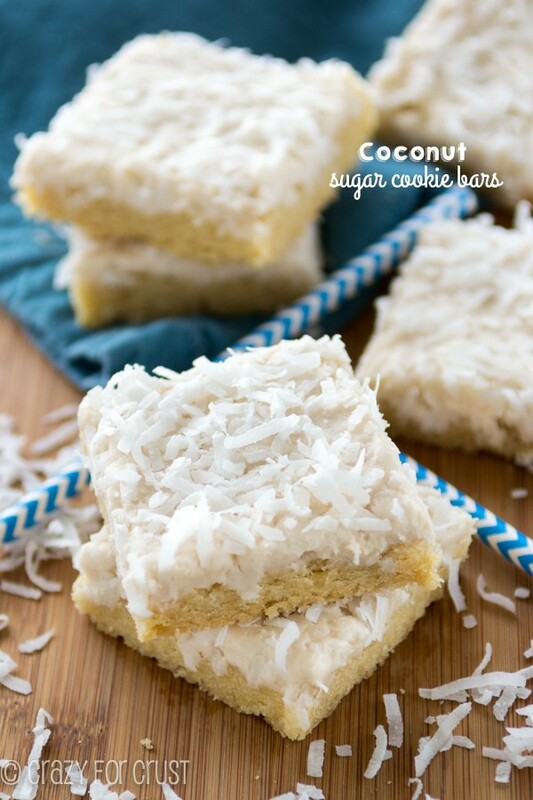 These cookies look so perfectly soft and amazing too! I love anything related to pumpkin spice. I can definitely see why you had to get rid of these, they wouldn’t stand a chance in my house! I am going crazy over these!! 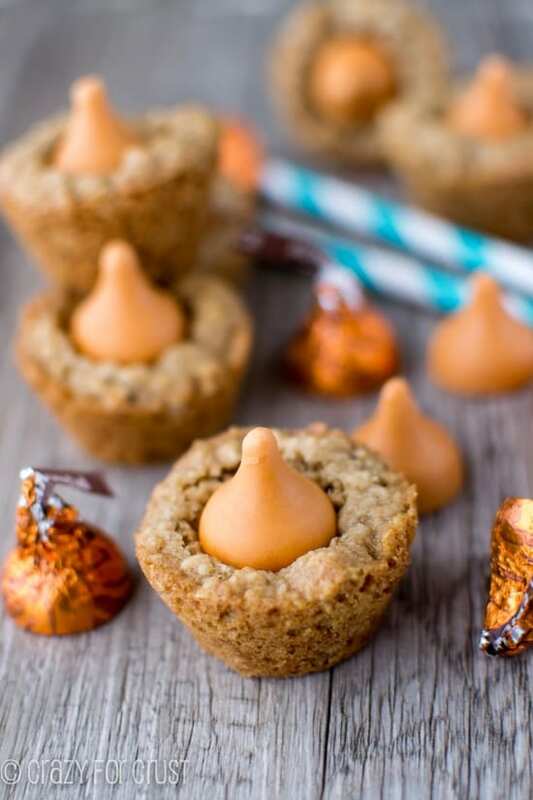 I am so obsessed with pumpkin right now and now I NEED to make these this weekend. They looks so soft and fluffy! They totally are! Too light – and easy to eat! Wow. I want these cookies. I really want them. Your pictures of these cookies are wonderful. Off to the store to buy pumpkin spice…. I’ve TOTALLY done the coffee grounds thing before too. Because I tossed out baked goodies that were sealed in a plastic bag, so it totally would’ve been safe to pull them out. But not after those coffee grounds — ick! Absolutely loving these cookies; I’d eat at least 5 in one sitting!! Yes, the sealed plastic bag throw away is pretty much begging you to get it out of the trash!! I just made these! The only thing I did different was add a spoon of maple syrup to the icing! These are so delicious! Icing was amazing but cookies turned out dry and didn’t spread out. I made sure the butter was softened. Any suggestions? ?